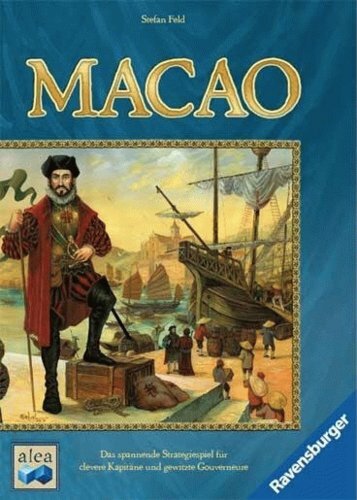 I finally got Macao to the table Sunday evening with two other players and I was less than pleased. I will withhold final judgment until I get at least one more play in but there were a few issues, one which I predicted, others which I did not. So what was the problem? Not the main cube mechanic. No, that was actually surprisingly fun and interesting and quite tricky to play correctly. And the rules themselves were fairly easy to grasp. No, my issue was the number of choices in the last few rounds of the game. In the first couple rounds you have 6 or seven choices of actions but very limited cubes to actually do them with. And often the colours of the cubes determined many of the choices. This was great and agonizing in a good way. In the last couple rounds things were different. We all had close to action 20 cubes to use which could possibly yield 20 distinct actions. Give yourself 7 different types of actions, 10 or more quarters left to conquer each requiring a different set of six different coloured cubes, and complete freedom in the order that you can do these actions. And let's not forget the action cards that we have all been forced to buy throughout the game, each one yielding a special advantage or power that can be taken at any point throughout the round. One player took a 17-minute turn. 17 minutes. I really think the cards are the major issue. Everything would be fine if you didn't have 10-12 different rule-breakers to factor into your decision tree. It started to feel a bit like Magic: The Gathering as you scanned your cards to see what you could still use that turn. It doesn't help that the printing on the cards is ridiculously tiny and many of them are poorly worded and wide-open to player interpretation as mentioned here by the other Eric Martin. Now don't get me wrong, I like choice in my games. I enjoy Le Havre and I love how the decisions expand over the rounds in Endeavor. But in Endeavor, the choices are still stream-lined and the choice grow very much linearly. Not so much here. Think exponential growth. I really want to like this game and will definitely give it another try. I enjoyed the first half of it immensely as I saw things slowly ramping up and tried to plan how and when I would receive the cubes I needed. Yeah, the cards are way too small and have far too much tiny writing. But I just don't know if the decisions are quite as hard as you're making out. You can only buy one quarter in the city a turn, and by the last couple of rounds, it should be pretty obvious which ones you need. You've hopefully got a plan about how you're going to activate your cards, and which cubes you'll use to do that is again pretty obvious ('cause the cards have little pictures of which cubes you need). If you've got goods to deliver, then you have to balance out how many VP you'd get there versus maybe not activating some cards or buying a quarter, but basically you just move your ship as far as you need it to go. One quarter a turn... Right, there had to be at LEAST one rule we messed up. That'll definitely make a difference. Must be my group. We play Stone Age and it takes 90-120 minutes. Seriously. 20 cubes seems like a lot in the last couple of rounds. In the last rounds all high numbered rolls get converted to 1's, so for example in Rnd 12 you only get 2 new cubes (1 of each of 2 colours) added to the "1" area. To get 20 cubes you would have had to load it up pretty heavily from earlier rounds. Unless we are playing it wrong of course. Also - just checking - you are using up all your cubes in each round aren't you? Yeah, we are using up the cubes. I know. It was a weird game but we didn't seem to stockpile for the end rounds.